Background: An interesting area of scientific research is the development of potential antiaging drugs. In order to pursue this goal, it is necessary to gather the specific knowledge about the adequate preclinical models that are available to evaluate the beneficial effects of new potential drugs. 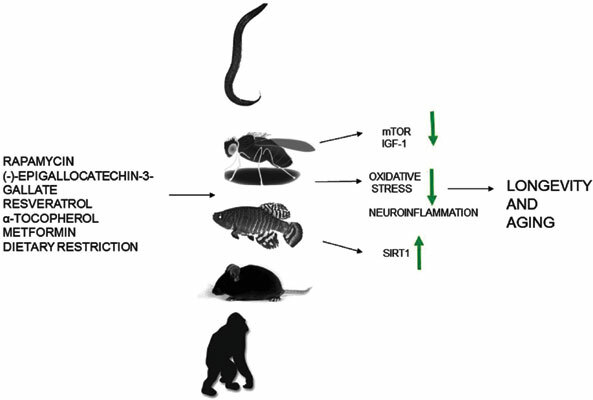 This review is focused on invertebrate and vertebrate preclinical models used to evaluate the efficacy of antiaging compounds, with the objective to extend life span and health span. Methods: Research and online content related to aging, antiaging drugs, experimental aging models is reviewed. Moreover, in this review, the main experimental preclinical models of organisms that have contributed to the research in the pharmacology of lifespan extension and the understanding of the aging process are discussed. Results: Dietary restriction (DR) constitutes a common experimental process to extend life span in all organisms. Besides, classical antiaging drugs such as resveratrol, rapamycin and metformin denominated as DR mimetics are also discussed. Likewise, the main therapeutic targets of these drugs include sirtuins, IGF-1, and mTOR, all of them being modulated by DR. Conclusion: Advances in molecular biology have uncovered the potential molecular pathways involved in the aging process. Due to their characteristics, invertebrate models are mainly used for drug screening. The National Institute on Aging (NIA) developed the Interventions Testing Program (ITP). At the preclinical level, the ITP uses Heterogeneous mouse model (HET) which is probably the most suitable rodent model to study potential drugs against aging prevention. The accelerated-senescence mouse P8 is also a mammalian rodent model for aging research. However, when evaluating the effect of drugs on a preclinical level, the evaluation must be done in non-human primates since it is the mammalian specie closest to humans. Research is needed to investigate the impact of new potential drugs for the increase of human quality of life. Aging, Resveratrol, sirtuins, IGF-1, mTOR, heterogeneous mice model, SAMP8.